The history of Persian orders and medals dates back to the era of Shah Fath'ali Qajar when military relations between Iran & European countries grew up. Before that time the kings and governors used to grant jewels and gifts and even titles to their commanders and sergeants to respect their faithful service and bravery. The most famous example of this custom is the King Shahrokh Afshar who granted the marvelous Kooh-e- Noor diamond to one of his guards for saving his life. A very famous portrait of Fath'ali Shah Qajar with his Kiani crown and royal jewels which are now kept in the National museum of Crown Jewels in Tehran. Several years later, during the reign of Nasser al-din shah Qajar many other marvelous orders were founded on various occasions. At this time the shape of orders became more artistic and they were still planted with jewels. 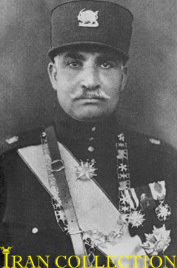 By the coup D'etat of Reza Shah Pahlavi on February 22nd, 1921 the overthrown of Qajar dynasty was set into progress. Four years later, in 1925, Ahmad Shah Qajar, the last king of Qajar dynasty fled to Paris and a few months later Reza Shah founded the Pahlavi dynasty that directed Iran to a more developed country. This change caused the disuse of many orders and also foundation of new orders and royal insignias. The sad part of the story is that as Reza shah was against Qajarian customs , the heritage of the Qajar's court were plundered and the Imperial orders & badges belonging to the royal family had the same ending. Only the crown jewels that were priceless and eye-catching could survive. Gathering information about some of these insignias is only possible through the paintings and portraits of the Qajar era. Pic. 2 : Early days of Shah Reza Pahlavi as the new king of Iran. Note the Order of Crown (Neshaan-e Taaj) and its grand collar worn by him. This order used to be the highest order of Qajar era since 1900. The collar is the order of Zolfaghar. 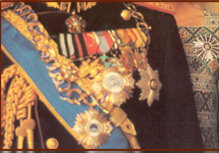 Click on the photo to visit the orders and insignias of Reza Shah Pahlavi Era. After the world war II, in the reign of shah Mohammad Reza Pahlavi, many other military and civil orders came into existence from which the orders of Haftpeikar & Aryamehr are the most famous and magnificent examples. These two orders were founded on behalf of the Shah's wives; the earlier one, the order of Haft Peikar (Pleiades) was founded in honor of Empress Sorayya -the Shah's 2nd wife- in 1957. Fifteen year later, the Aryamehr order was founded a few months before the coronation ceremony for Queen Farah. Also, there existed so many different medals and insignias that were offered by various organizations and universities on Public occasions such as the coronation of 1967 and the 2500th anniversary of the foundation of Persian Empire in 1971. Although these medals are not as valuable as the official orders but after the revolution of 1979 they gained their own price. Pic. 3: Portrait of Shah Mohammad Reza Pahlavi and Queen Farah in mid 1970s. The king is wearing the grand cordon and sash of Pahlavi order plus Order of Zolfaghar on the left side. The collar is the Order of Sepah. The queen is wearing the Order of Aryamehr. Click on the photo to visit the gallery of Orders & Insignias of Shah Mohammad Reza Pahlavi era. By the Islamic revolution in which 2500 years of monarchy came into an end, the royal family and all aristocrats fled to other countries and this caused an irreparable injury to the heritage of Iran. Most of them took their properties out of Iran and the remaining were put into requisition by the new Islamic government, which a part of these antiques are exhibited in the museums of Bonyad. Sadly, the remaining valuable collection of orders and insignias of Qajar era, kept in Golestan Palace was plundered by the rebels in the early days of the revolution. For about 10 years after the revolution, there wasn't any official civil order in use; hence nobody was offered one. It was around 1990s when the government decided to found new types of official civil orders and introduced about 12 or 14 types of civil and military orders, each in 3 classes. Since that time these orders are granted to some military men and famous Iranian scientists. Unfortunately there is no available data and photo about these new Islamic series even in the official website of the President of the Islamic republic of Iran. Any photo or description is welcomed. Pic. 4: Former president of Iran, Mohammad Khatami, while granting a Martyrdom order to the mother of an Iranian soldier who was killed in the Iran-Iraq war. Photo by IRNA, 2005.